Germany is Europe's most industrialized and populous country. Famed for its technological achievements, it has also produced some of Europe's most celebrated composers, philosophers and poets. Achieving national unity later than other European nations, Germany quickly caught up economically and militarily, before defeats in World War I and II left the country shattered, facing the difficult legacy of Nazism, and divided between Europe's Cold War blocs. Germany's economic success since World War II is to a large extent built on its potent export industries, fiscal discipline and consensus-driven industrial relations and welfare policies. It is particularly famed for its high-quality and high-tech goods. Germany's export-dependent economy was initially hit hard by the global financial crisis of 2008-9, which triggered the worst recession since 1949. But by 2010, its exports had helped the country to rebound more robustly than most other EU members. However, an ageing population has led to concern over the continued viability of Germany's high welfare and health spending. There is also a debate about how to improve integration of the many post-war immigrants whose labour helped fuel the economic boom. In addition, what was once the German Democratic Republic, the former Soviet-dominated east, has struggled to catch up with the more affluent west after reunification, while people in west had to pay a higher than expected financial price. The pain of Germany's Nazi-era history remains a sensitive element in the country's collective modern-day psyche. Out of the devastation of World War II grew an awareness of the need to guard against any such catastrophe recurring on the continent. In the 1950s Germany was one of the six founding nations in the original European Economic Community from which the European Union was eventually to develop and in which Germany is a key player. Franco-German cooperation was central to European economic integration in the 1980s and 90s. After decades of lagging behind its economic strength, Germany's international profile has been growing. The country sent peacekeepers to the Balkans and its forces have been involved in operations in Afghanistan. The country has famous beer brewing traditions. Beer purity laws dating back to 1516 limit the fermentation ingredients to malted grain, hops, yeast and water. As the birthplace of Johann Sebastian Bach, Ludwig van Beethoven and Johannes Brahms, among others, Germany's gift to European classical music is colossal, while Goethe, Heine, Kant and Thomas Mann are giants in the world of letters and philosophy. Mr Gauck describes himself as a "liberal left conservative"
Joachim Gauck, a human-rights campaigner and former East German dissident, became president in March 2012. The opposition Social Democrats and Greens nominated him after the resignation of President Christian Wulff in February over a housing loan scandal, and the governing centre-right coaltion parties agreed to support him. 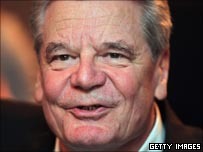 Mr Gauck stood for the largely ceremonial presidency in 2010, losing to the government's preferred candidate Mr Wulff. Mr Gauck, like the Christian Democrat chancellor, Angela Merkel, has a background in the Lutheran Church in East Germany - he was a pastor there, as was Mrs Merkel's father. An active anti-Communist from an early age whose father was exiled to a Soviet forced-labour camp for several years, Mr Gauck was a leader of the opposition New Forum in the last days of the East German dictatorship. He served in the first and last democratic East German parliament, which put him in charge of investigating the archives of the Stasi secret police. He continued this task after the reunification of Germany, earning the admiration of all but diehard Communists for his work in exposing the crimes of the Communist era. Mr Gauck describes himself as a "liberal left conservative", and has expressed support for the policies of both Social-Democrat and Christian-Democrat coalition governments on a non-partisan basis. In recent years he has concentrated on campaigning against both left and right extremist threats to Germany's democratic system. Born in Rostock in 1940, Mr Gauck has four children by his wife, from whom he is separated. His partner since 2000 is the journalist Daniela Schadt, who will take on the ceremonial duties of First Lady. Angela Merkel, Germany's first female chancellor, swept back to power in general elections in September 2009. 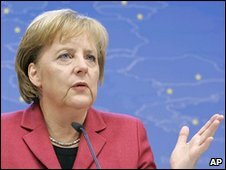 Mrs Merkel, leader of the conservative Christian Democrats (CDU), first took office in an 2005. As a result of the vote's close result, she became chancellor in a "grand coalition" involving the CDU, its Christian Social Union (CSU) allies and the centre-left Social Democratic Party (SPD). In 2009, her party secured another four-year mandate with enough votes to dump the previous awkward coalition with the SPD in favour of an alliance with the smaller, pro-business Free Democrats (FDP). The coalition faced the tough challenge of dealing with the fallout from the 2008 global economic crisis. Mrs Merkel won plaudits for her calm handling of the situation, but her ability to weather a storm was put to an even more severe test once the full scale of the crisis in the eurozone began to emerge early in 2010. As one of the richer countries in the EU, Germany was faced with the prospect of having to make huge contributions to bailouts for debt-ridden countries such as Greece, and popular resentment over this triggered a political backlash at home. In May 2010, Mrs Merkel's coalition lost a key regional vote, and with it her majority in the powerful upper house of parliament, the Bundesrat. The following March, her party also lost the key state of Baden-Wuerttemberg, traditionally a CDU stronghold. In December 2011, Mrs Merkel told the Bundestag that Europe was working towards setting up a fiscal union in a bid to resolve the debt crisis. But she also also reiterated her opposition to the European Central Bank issuing "eurobonds" backed by all eurozone members. Angela Merkel became leader of the CDU in 2000 after her predecessor Wolfgang Schaeuble resigned in connection with the party funding scandal that also tainted her long-time mentor, former Chancellor Helmut Kohl. She was born in Hamburg in 1954 but grew up in East Germany where her father was a Protestant clergyman. She holds a doctorate in physics. She divorced her first husband Ulrich Merkel in 1982 and has been married to publicity-shy chemistry professor Joachim Sauer since 1998. She has no children. 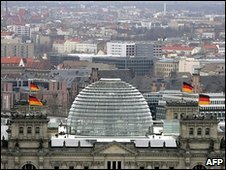 Germany is home to some of the world's largest media conglomerates, including Bertelsmann and the publisher Axel Springer. 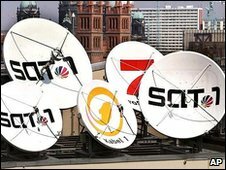 Some of Germany's top free-to-air commercial TV networks are owned by ProSiebenSat1, a consortium led by a US billionnaire. There are several national newspapers, but the press market is strongest at a regional level, with more than 300 titles. Bild tabloid is the best-selling daily. By March 2011 nearly 80% of Germans - 65.1 million people - were online, Internetworldstats reported. The leading social network is Facebook, with more than 20 million users. Its rivals include wer-kennt-wen and meinVZ. What is Germany's vision for Europe?